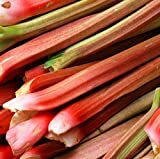 Rhubarb plant growing rhizome leaf plant of the genus Rheum also known as Rheum rhabarbarum, Rhubarb plant perennial evergreen plant also used as ornamental plant, grows in temperate climate and growing in hardiness zone 3-9. 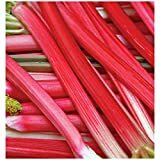 Leaves color green the vain sometimes can be red, the shape is deltoid to shapeless, size can be more than 0.5 m.
Stalk edible the color of the stalk can be green or red, the stalk use for sweets. Flower color white, the flowers grow on stem in inflorescence. How to harvest the leaf stalk?